Often an integrated activated carbon filtration system requiring a combination of products and technologies is the best solution for environmental remediation and industrial process problems. TIGG’s experienced engineers listen to customers, determine their precise needs, and develop answers. TIGG provides manual and automatic valves, piping, and ductwork, flow control, and measurement for all of the above applications. TIGG offers integrated systems for environmental remediation and industrial process in three main categories: Mobile, Temporary, and Permanent. When an environmental remediation firm was contracted to clean up PCB organic chemicals from a polluted streambed, TIGG engineers designed an activated carbon integrated filtration system to cleanse the water and help recover the environment. The integrated remediation system began with a tank to capture and store water from the diverted stream. The water was then sent through a TIGG tank filled with sand filtration media to remove larger particles. Next, the water was filtered through a series of bag filters to remove smaller contaminants. The flow then entered a CANSORB C-500 modular adsorber where activated carbon captured the organic contaminates. Finally, the flow went through another set of bag filters to polish the water for reintroduction to the environment. TIGG engineers custom-tailored the integrated liquid environmental remediation system using a combination of technologies and techniques. Whether renting or purchasing equipment, integrated system design solutions are all included. TIGG offers integrated environmental remediation systems designed for mobile environmental remediation operations that can move with your projects. TIGG has provided complete mobile integrated environmental remediation systems which have been mounted on small trailers and on 48 foot single drop trailers. TIGG works with each client to develop the appropriate mobile trailer treatment system in accordance with the client’s specifications. These trailer systems can be outfitted with a wide variety of remediation equipment selected by TIGG and combined into a mobile integrated system that functions as a single unit. The integrated systems may include controls stations as well. Each mobile trailer treatment unit can be designed to withstand the elements by including heating systems and insulation when needed. Many site remediations are temporary and some require equipment on site on short notice. TIGG can and has provided a variety of integrated systems which have been used for a few weeks or months and some which must be operable within a few days from the date of order. 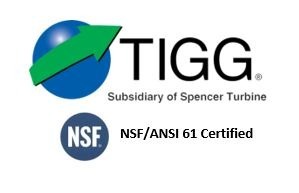 TIGG’s integrated environmental remediation systems include filters, adsorbers, piping and valves on an emergency basis. TIGG has also provided oil removal media absorbers, activated carbon in vessels, pumps, and bag filters for many temporary applications. At MGP site remediation projects all across the county, our large activated carbon box adsorbers are so prevalent that whether they are built by us or not, many in the industry simply refer to adsorbers of this type “TIGGs.” The box adsorbers are part of an integrated system that includes a blower, duct work and a box adsorber to recycle air inside enclosed fabric structures where the remediation takes place. For more information about TIGG’s Integrated Activated Carbon Adsorber Systems, call 1-724-703-3020 or click here to contact us.